How to list my programs in my User Applications folder? Somehow (a long time ago) I deleted the contents of the Applications folder under my username (User/Applications). However, when I typed "Applications" into Spotlight, it gave me a folder called Applications with all my Adobe products, MAMP and other software in it. So what I did was "select all" on those applications and dragged them to the empty Applications folder under my username. It's taking a long time to copy and I don't think I really wanted to duplicate the data so I hit cancel. It seems you duplicated your applications. To be sure, you can do a Spotlight search of one of your application and see if it's listed twice. Your "original" applications are under /Applications/. You can find it by opening Finder, ⌘+⇧+G, entering /Applications in the text box, and validating. It's a folder at the root of your hard drive that Apple put there to hold all the applications for all the users. Once you checked they're in double, you can delete the ones that are in your user folder. Your idea of putting all your application under your user account is not a good. Some applications, especially the built in ones, don't like to be moved, and since they already have that special place for them, what's the point? But, you can do it for your own applications, such as Firefox, Adium, etc. Those applications can be moved from /Applications/ to the Applications folder in your user account. Final question, why do you want your application listed under your user Applications folder? I you really want to do that, I guess you can make an alias. Go into /Applications/, select all the applications, hold ⌘+⌥ while moving them into the new location. Not the answer you're looking for? 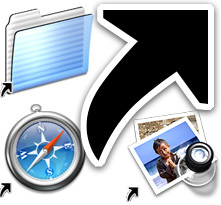 Browse other questions tagged macbook finder applications . How can I select all files within a directory with subfolders?